Broccoli is good for you. It’s full of vitamins, minerals and fiber. Research also shows that Broccoli can contribute to bone health and inhibits certain cancers. And when you choose organic, you are keeping chemical pesticides, synthetic fertilizers, and genetically modified organisms our of our food system and environment. When you purchase the NFCA’s Northeast Grown Frozen Fruits & Vegetables, you are not only making a good decision for yourself and your family, you are helping to grow the regional food system and economy. 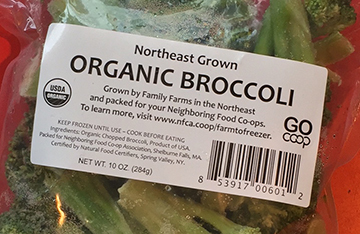 Our frozen Blueberries, Organic Broccoli, Organic Edamame, Organic Green Beans, and non-GMO Sweet Corn and Green Peas are all produced, picked, processed and packed (say that five times fast) right here in the Northeast. And they are available only at your local Neighboring Food Co-op. This recipe is designed to be quick and easy, designed around one 10 oz package of frozen Broccoli and ready to eat in 30 minutes. You could also try Hot Pepper Flakes (if you like a little heat), or Parmesan Cheese. Remove, place on a small platter and serve as a side or snack! To learn more about the NFCA’s Frozen Products, visit http://nfca.coop/FarmToFreezer.